As soon as the drywall was complete, we arranged for our choice of finish carpenter – Curtis Prince – to come in, set up his carpenter’s “shop” and install interior trim on our lovely Andersen windows. For some strange reason, we can’t find photos of Curtis working on the windows but here’s one that shows Curtis cutting fine-grained, “finger-joint” plank wood (made from small pieces glued together) in his “shop” downstairs, with a trimmed out window behind. Here’s Curtis carefully cutting out the stair shapes on the trim that covers the stair “stringers” – the long zig-zag pieces that were installed in the framing process and will be the only aspect left when Curtis is finished. Note that, in this photo, Curtis is cutting at an angle. 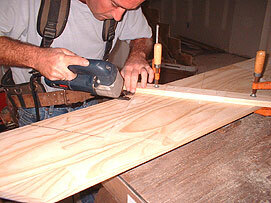 This is so he can miter the joint with the stair risers. Curtis does not believe in leaving grain end showing on a finished job. 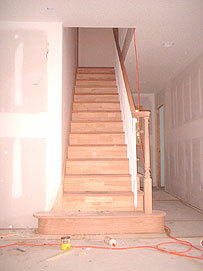 Soon Curtis had the stair “risers” – the front parts that hold the tread up – replaced with finger-joint plank and was ready to install the finger-joint wall trim that follows the stairs up the wall. Note that Curtis removed the rough treads, cut them shorter and replaced them so he can get to the wall and still work safely. Meanwhile, Barbie got on with painting the walls. She volunteered to be responsible for all painting for the house. Note that the color is a very neutral light pink/peach. We decided to go with one wall color throughout the house to begin with and repaint later once we’re sure of the feel of our home. It took a week or so of painstaking master carpentry but soon Curtis had all the solid oak treads in place, all the stair trim installed and the stair rail near finished. 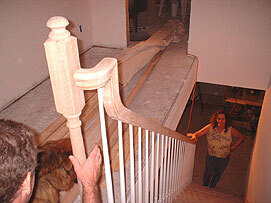 In this photo, Curtis is installing the “newel” post that holds both the stair rail and the upstairs hallway rail. Note that the hall rail is not in place yet. 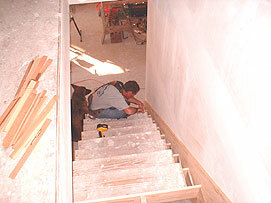 That’s Elizabeth at the bottom of the stairs, delighted at the way Curtis is shaping the beautiful staircase. Curtis’s dog, Sam, lies quiet at his side. The upstairs hallway rail complete, Curtis’s staircase is ready for sanding and finishing. One of the million finishing jobs that fall to Barbie or Elizabeth, at this stage. Curtis did a fabulous job. Note the extra-wide, curved starting stair, the “turn-out” to the rail on the start newell post, the balusters just visible upstairs and, wonderfully, the feel of harmony and balance in the proportions. Curtis and Elizabeth talked a lot about achieving this but Curtis deserves all praise and gratitude for his carpentry skills in creating it. 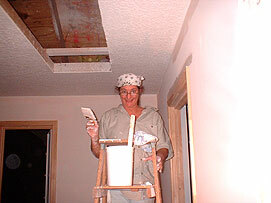 About this time, Elizabeth started laying the cement-board backing material in the bathroom. 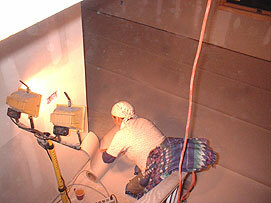 Here she is applying “thin-set” direct to the carefully-cleaned rough flooring that will “glue” down the pieces of cement-board she has precut to fit. Then they’ll be nailed down, too. Notice the missing toilet bowl to her left. It will be installed when floor tiling is complete. After a couple of days spent immersed in the painting project, Barbie gets a little ga-ga – but she’s holding up! 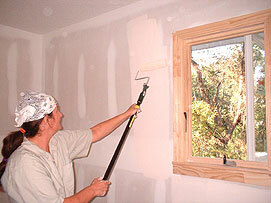 Here she’s painting around the window trim in the spare bedroom upstairs. 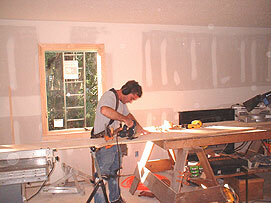 Notice the opening in the ceiling ready for the attic door ladder. No rest for the ambitious owner/builder. Here’s Elizabeth again, hard at work at 5AM gluing special crack-reducing tile underlay paper to the entire downstairs floor area before the tilers show up at 9AM. 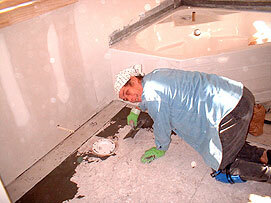 She thought laying cement-board was bad until she emerged sticky and filthy from this easy but demanding task. The entire project has required constant clean-up and this redoubled through the finishing process. 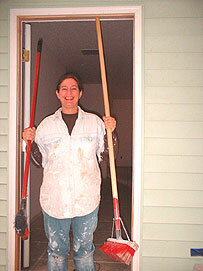 Every phase needs attention to the cleanliness of the house to ensure the most effective work. Here Barbie shows us the most used tools on the job – now well worn and showing it – unlike Barbie! Next – installing the tile and the kitchen cabinets!